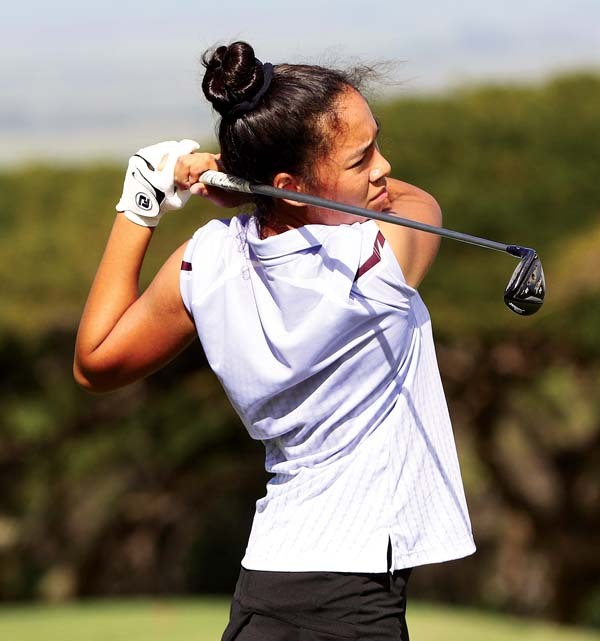 Lana Calibuso-Kwee fired a 38 to take medalist honors and lead the Baldwin High School girls golf team to a 131-152 victory over Lahainaluna on Saturday afternoon at Kahili Golf Course. 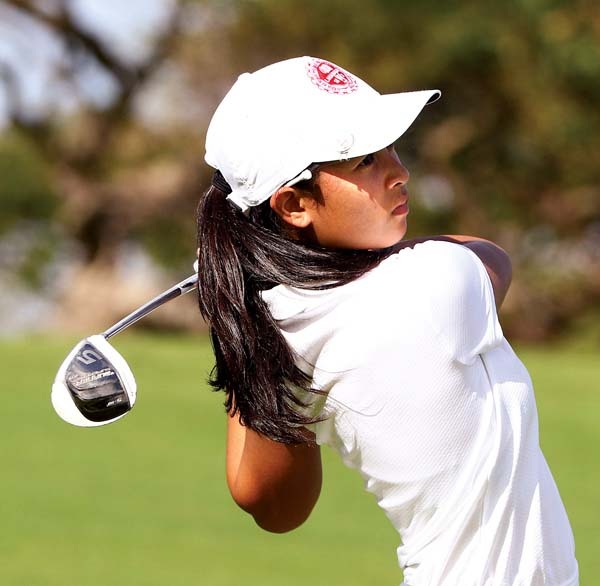 Alexa Jackson had a 43 and Sienna Kawahara added a 50 as the Bears improved to 4-0-0 in Maui Interscholastic League play. Danica Galindo’s 56 was dropped. 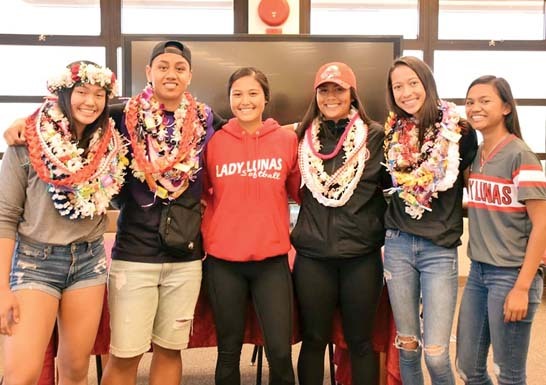 Baldwin is guaranteed at least a spot in a possible 18-hole playoff for the team championship — they can clinch the title outright as early as Tuesday with a win over Seabury Hall or a loss by Maui High to Lahainaluna. The Lunas (0-3-1) were led by Hannah Valencia’s 46. Ashley Langaman shot a 50 and Alana Duran had a 56. At Waiehu Municipal Golf Course, Reese Guzman shot a 39 as the Sabers got back to .500 with a victory over the Spartans. 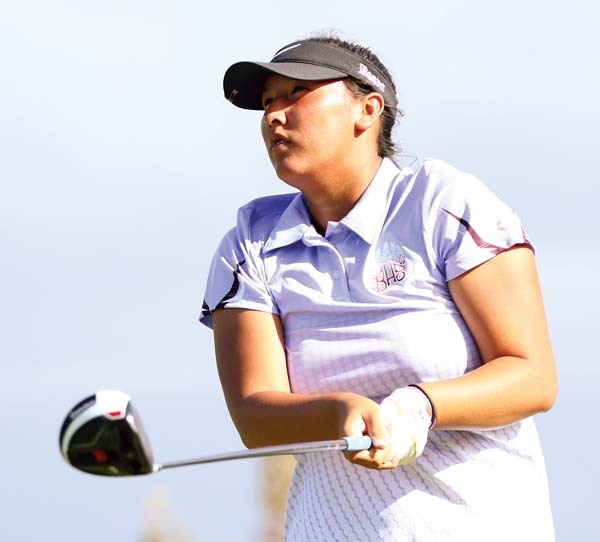 Emily Mitra had a 41 and Jillian Ped carded a 45 for Maui High (2-2-0). Seabury Hall (1-2-1) got a 40 from Joy Callinan and a 47 from Kelsie Sparks, and also had to take a dummy-score 72. At Maui Country Club, Ryan Chang and Hudson Jackson each shot 39s to lead the Spartans to an easy win. Kyle Sparks shot 40, Max Flammer had a 41 and Pierce Dowd’s 42 was the dropped score for Seabury Hall (8-0), which clinched at least a tie for the MIL team crown. The Spartans play Maui High twice this week, and the Sabers must sweep to force an 18-hole playoff for the team title. Beau Johnston and Hudson Holland each shot 38s for Na Pueo (5-3), while Griffin Gibson had a 50 and Akiva Bluh shot 53. Jerone Samari’s 60 was the dropped score for Maui Prep. At The Dunes at Maui Lani, Jordan Terada fired a 41 to help the Sabers (6-2) keep their team title hopes alive. Kaleb Makimoto had a 43, Asher Apili added a 44 and Noah Manual a 56 for Maui High. Dane Abarra shot 43, Jordan Mitsumura had a 45, Puniawa Vedder fired 48 and Kody Cambra carded a 52 for Kamehameha Maui (3-5). Marcus Ayau’s 68 was the dropped score for the Warriors. At the Kaanapali Kai Course, Jensen Powley fired a 39 to lead the Lunas (2-6) past Na Alii (0-8). 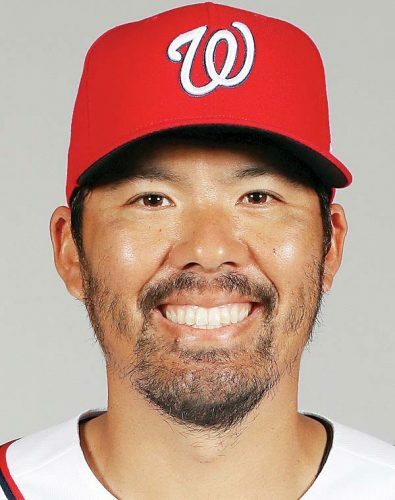 Matt Ramelb had a 43, Jonas Marcial shot 45 and Kaito Nishiji had a 49 for Lahainaluna. Trevor Onaga shot 49, Alohi Dela Cruz fired 56, Kapono Mossman carded a 59 and William Kahalekai shot 65 for King Kekaulike. Baldwin vs. Seabury Hall at Maui Country Club, 3:30 p.m.
Maui High vs. Lahainaluna at Kaanapali, 3:30 p.m.
Lahainaluna vs. Maui High at Waiehu Municipal Golf Course, 2:30 p.m.
Seabury Hall vs. Baldwin at Kahili Golf Course, 3:30 p.m.
Seabury Hall vs. Maui High at Waiehu Municipal Golf Course, 2:30 p.m.
Kamehameha Maui vs. Lahainaluna at Kaanapali, 3:30 p.m.
Maui Prep vs. King Kekaulike at Pukalani Country Club, 3:30 p.m.
Maui High vs. Seabury Hall at Maui Country Club, 3:30 p.m.
Lahainaluna vs. Kamehameha Maui at The Dunes at Maui Lani, 3:30 p.m.
King Kekaulike vs. Maui Prep at Kapalua Bay, 3:30 p.m.